After moving into my dorm room, my roommate and I installed a shower curtain so we could simultaneously use the washroom. However, a couple of days ago, while enjoying my little space of privacy after a long, tedious day of classes, to my horror, the shower curtain came crashing down – exposing me to the world and destroying the rejuvenating moment I was having. Turns out the cause of the hazard was due to the poor friction between the curtain rod and the stand that holds it – consequently, it slipped. Thus I began my mission to find the best shower curtain rods there is. We couldn’t drill into our dorm room wall, so I narrowed down the search to the top quality shower curtain rods for tile and I’m here to share with you all that I found after my extensive research. How to choose which curtains rod to get? What rod material is the best? How do you install shower curtain rods? Expanding from 43-75 inches, the InterDesign’s Forma curtain rod is versatile and suitably fits most bathrooms. Additionally, the non-slip feet offers a promising grip while the material it is coated with ensures it is gentle on your wall and leaves no marks. The rod is also easy to install – only requires a pull and twist thus eliminates the need to hire people to do the job for you! 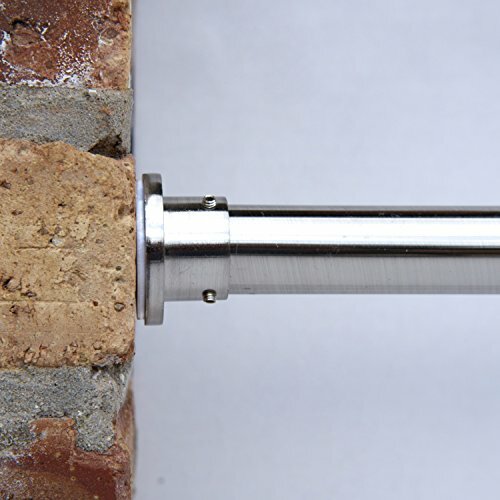 Another curtain rod constructed with Constant Tension technology – making life easier. 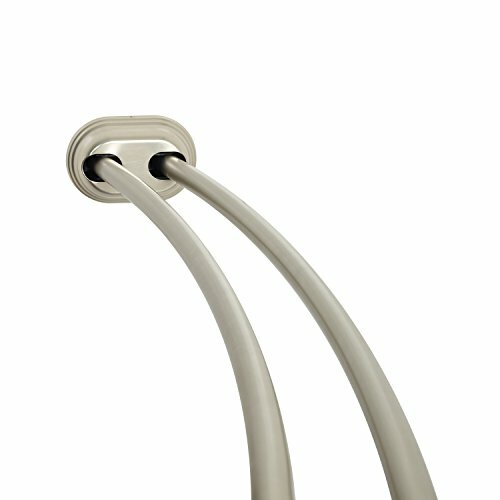 The bronze finish gives the rod an elegant touch to amp up your shower corner and complements your curtain design. Moreover, made of rust-resistant steel, the rod is highly durable. When a manufacturer offers a lifetime guarantee, it is certain that the product is reliable! 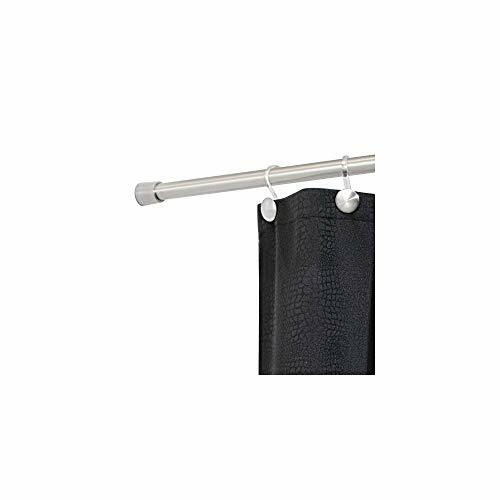 Such is true for this Zenna Home bathroom curtain – while built to last, the rod is coated with high quality Aluminium materials to fight off rust for an indefinite period of time. Conversely, the curved design offers extra shower space for ultimate comfort. Stability is inevitable when it comes the Astor shower curtain. Built to withstand pressure and stay intact – it’s a safe product to use in a house where children and pets loiter in the bathrooms. The no drilling technology, on the other hand, keeps you away from destroying the tiles thus recommended for dorm rooms or rented apartments. Unlike generic shower rods, the two rods of this model equally distribute the weight to provide the maximum level of stability. No more curtains accidentally tumbling down for little inconveniences. Moreover, being around water all day, the rod is exposed to rusting and deteriorating however with the aluminum construction, rusting is highly unlikely! The InterDesign’s promise is to provide users with exclusive products that are efficient at what it does and beautifully made and this model does not fall behind. With an adjustable curve, create more elbow space for a more relaxing experience. Featured in different colors, it is easy to pick the one that best goes with your interior. Another of Zenna Home’s creation that is reliable, and quick to install for an effortless experience! The adjustable feature suits most spaces while the decorative finish instantly amps up your shower corner. 30 pounds withstanding ability is also another commendable feature of this shower rod. Constructed in four different sizes, the disappointment of purchasing a rod that’s a wrong fit for your bathtub is eliminated hence you can find the one that perfectly fits! Rubber end pads allow for firm locking and consequently allows flexible use to hang curtains, drapes, clothes, etc. 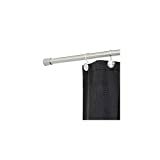 A full installation kit comes with this curtain rod which includes mounting brackets, wall anchors, and screws along with the installing instructions thus making the assembly process trouble-free. With a promise to provide 25% room space and suit 99% of showers, obtaining a luxurious shower is highly expected. Made with premium quality materials, the iron rod is durable and adjusts to desired lengths. Rubberized pads on each end of the rod protect your tile and ensure a dependable grip and the availability of the different colors coordinates with your personalized bathroom scheme. The seller also offers hooks that match the colors of the rod! The material of the rod decides the durability, stability and whether its rust and corrosion proof or not. 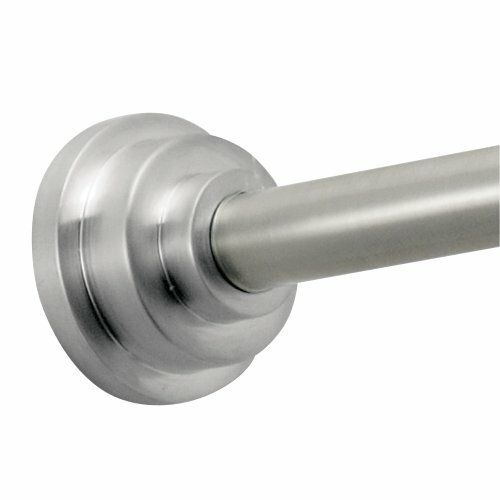 According to users, shower rod material is steel or aluminum. It is important to ensure that the rod you get allows for smooth hook movement so that it doesn’t scratch the surface of the rod or bring you trouble. Also, ensure that it doesn’t make a sound when you’re moving your curtain. For a hassle-free experience, consider a rod that you can install by yourself. These are usually rods that feature tension tight technology and only require you to extend and twist to put it in place. Such a system offers a no-tool solution thus super easy to assemble and start using. For rods that require drilling, it is helpful to find a rod that comes with its own installation kit. You can find rods that come in different colors and designs. In order to purchase a rod that does not look out of place in your bathroom, but one that follows the color codes of your interior and adds style to it. Buying a rod that fits your required space is perhaps the most significant consideration. Consider the proportions of the rod and the space available for it. This is important in order to ensure that your rod isn’t too small or too large for your needs. Adjustable rods are found if you are uncertain of your space measurements. Starting from single rods, you can find curved shower rod to create more space around your bathtub and double rods that allow you to hang two curtains or use one as a towel and clothing rack. Decide the type of place you want to cover and hence the type of rod you need. → Check out our recommended showerheads review post. Having the choice of where you want to place your curtain allows you to determine the amount of space you want to maneuver when showering. Curved curtains on the other hand generously increase the moving space by pushing the curtain away from the shower stall. Then best bathroom curtain rod tension ensures that the curtain is properly placed and is irresponsive to the pressure applied it. It reduces the chances of the rod slipping and hence prevents accidents. Although designed specifically for shower curtains, shower rods are extremely resourceful and hence serve other purposes such as room dividers, clothing hanger etc. Allows simultaneous use of the bathroom –With a rod that promisingly stays in place, it allows for you to maintain your privacy while another house member uses the washroom. This is important for students who share dorm rooms or even for families with limited bathrooms. Functionality at a cheap price is the best way to describe the Constant Tension patented technology offered to you by InterDesign. The curtain rod is adjustable thus suitable for most spaces and highly efficient in terms of staying put wherever it is placed. The pull and twist mechanism provides a no-tool solution for tiles you don’t want to drill into – simply pull to your desired size and take off the sticker to get it functioning! The safety coat, on the other hand, guarantees a non-scratch experience for your tiles. 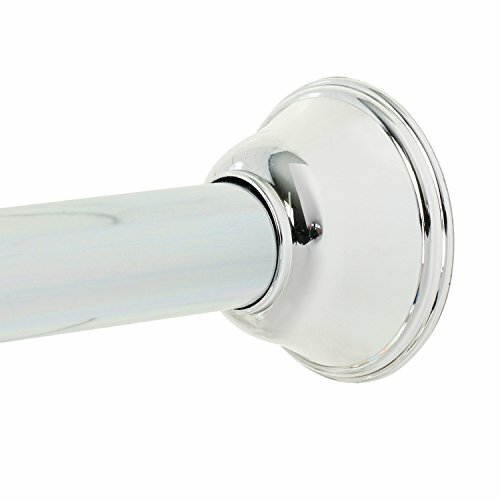 Ideally offers the best quality shower curtain rod tension! 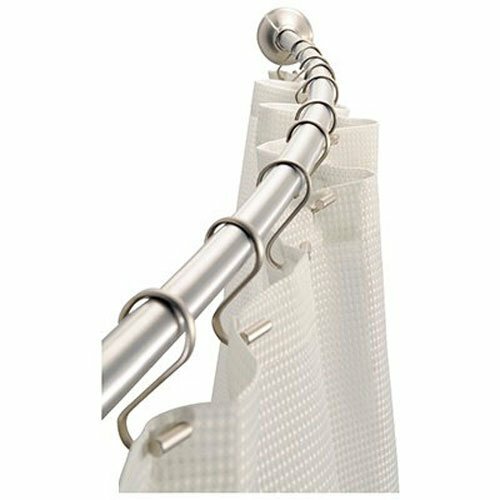 Combining elegance and efficiency, the Zenna Home provides its users with the ultimate bathroom curtain rod that lives up to expectations and functions as advertised! Although priced higher than most rods, the rod generously pays you back with convenient service! 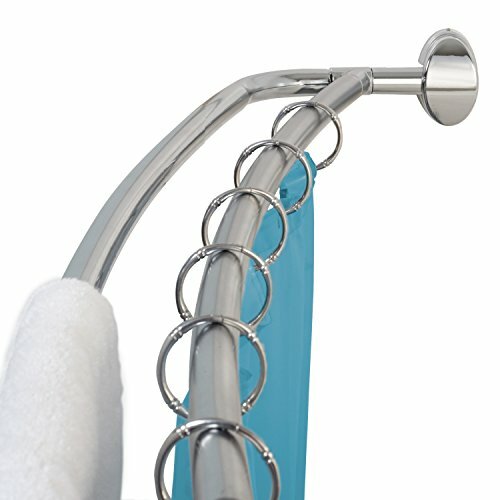 The double rod feature allows you to use the rod as a towel rack while the curved structure creates more breathing room. The colors, on the other hand, allow you to pick the one that best complements your bathroom décor. Backed up with a lifetime guarantee, peacefully shower knowing your damages will be taken care of – no wonder it is considered as one of the best-curved shower curtain rods among users! The choice of material really depends on your budget and the desired design. Plastic rods are affordable and come with great designs however not durable. Thus for functionality, metal would be the winning material for its rust-proof ability, durability, and stability. The most important step is to measure the space between the walls that surround your shower stall. Keep in mind that if you are buying a tension rod, you will need one that is slightly bigger than the measured space. The next important step is to measure the height of the chosen curtain and marking it on the wall to determine the location of the rod. The steps after these depend on the type of rod you purchase thus consider manufacturer specifications on how to install the particular model you purchase. Bathrooms are the most intimate places thus require attention to details – maintaining hygiene and privacy is vital. Bathroom curtains happen to satisfy both – the enclosure ensures water doesn’t splash out and at the same time prioritizes solitude. 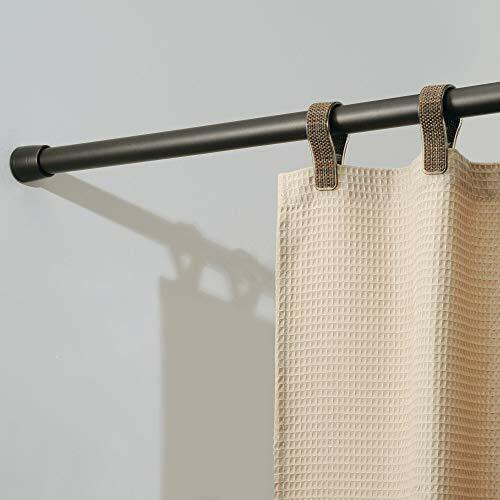 Shower curtain rods, on the other hand, ensure that the curtain does its job by keeping it where it belongs and allowing you to conveniently use it. 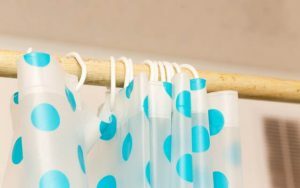 Considering the best shower curtain rods that are mentioned in this article guarantees you exceptional value at your doorstep. With these quality rods, your curtain will hold its place, add a modern style to your bathroom, offer you a luxurious shower experience and furthermore, ensure a lifetime service! If you’re still wondering what the best rod for shower curtain is, a personal favorite is the Zenna Home 35644BN. This shower rod is the ultimate package! Zenna Home is a promising source to obtain quality products and such is proven through the service of the double rod, curved, tension rod. While allowing flexible use of the double rod, the curved structure promotes space and the tension mechanism offers a hassle-free assembling and furthermore, requires no drilling! Meanwhile, with a lifetime guarantee, you are sure to exploit it for the highest level of comfort.